Brother Norman Wray, FSC, of the Midwest District, died on December 23, 2014, in Karachi, Pakistan, at the home of his caregivers. He was 91 years old. A Mass of Christian Burial and interment were conducted in Karachi. Memorials may be made to the Christian Brothers Retirement Fund, 7650 S. County Line Rd., Burr Ridge, IL 60527. 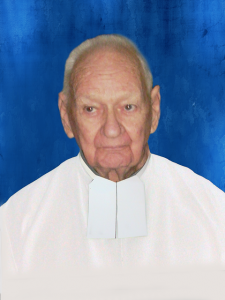 Brother Norman (Hermeus Norman) Wray was a De La Salle Christian Brother for 73 years. He was born in Chicago, the son of Joseph and Frances (née Coffeen) Wray. He graduated from St. Patrick H.S. in Chicago and earned a BSS degree in 1946 from St. Mary’s College in Winona, Minnesota. He professed his first vows in 1943 and his final vows in 1948. During his years as an educator he taught at De La Salle High School in Kansas City, Missouri, St. Mel and St. Patrick high schools in Chicago, and at the Brothers’ scholasticate in Glencoe, Missouri. From 1962 to 1967, he served in schools in Sri Lanka, India and Guatemala. In 1967, he established St. Patrick Technical High School in Karachi, Pakistan, and later became principal. Following his retirement in 1982 in Pakistan, he served at the Marie Adelaide Farm with leprosy patients and some years later established a program for drug addicts. In 2011, he moved to assisted living for care with Alzheimer’s disease.